Bensalem Himmich and Dr. Abderrezak Belagrouz were announced as Sheikh Zayed Book Award 2019 winners on March 16, 2019. The Sheikh Zayed Book Award is presented yearly to Arab writers, intellectuals, and publishers as well as young talent whose writings and translations of humanities have scholarly and objectively enriched Arab cultural, literary and social life. The award winners get a gold medal, a certificate of merit, and 750,000 dirhams. The longlist for the awards were announced in November with several Africans making the cut and the shortlist announced in February. 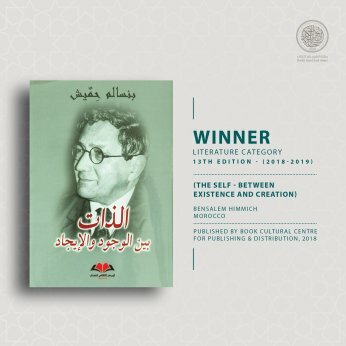 The award winners were announced on March 16 with Bensalem Himmich being recognised in the literature category for his memoir The Self: Between Existence and Creation (Le Centre Culturel Du Livre, 2018). The young author award went to Algerian scholar Dr Abderrezak Belagrouz for his academic work The Essence of Values and the Freedom of Social Concepts, (The Arabian Establishment for Thought and Innovation, 2017). Click here to read more about the other category winners at our friends at Arablit.org. Previous Previous post: A snapshot of the Mboka Festival 2019. Next Next post: Novuyo Rosa Tshuma makes Rathbones Folio Prize 2019 longlist.